I would say that if the village perishes India will perish too. India will be no more India. Her own mission in the world will get lost. The revival of the village is possible only when it is no more exploited. Industrialization on a mass scale will necessarily lead to passive or active exploitation of the villagers as the problems of competition and marketing come in. Therefore we have to concentrate on the village being self-contained, manufacturing mainly for use. Provided this character of the village industry is maintained, there would be no objection to villagers using even the modern machines and tools that they can make and can afford to use. Only they should not be used as a means of exploitation of others. India does not need to be industrialized in the modern sense of the term. It has 7,50,000 villages scattered over the vast area 1900 miles long 1500 broad. The people are rooted to the soil and the vast majority are living a hand to mouth life. What ever may be said to the contrary, having traveled throughout the length and breath of the land with the eyes open and having mixed with millions are living in enforced idleness for the last four month in a year. Agriculture does not need revolutionary changes. The Indians peasant requires a supplementary industry. The most natural is the introduction of the spinning wheel not the handloom. The latter cannot be included introduced in every home, whereas the farmer can, and it used to be so even a century ago. It was driven out not by economic pressure but by force deliberately used as can be proved from authentic records. The restoration therefore of the spinning wheel solves the economic problem of India at a stroke. In 1934 Gandhi resigned from the Indian National Congress over his differences with other leaders on the purity of ends and means. He established the "All India Village Industries Association" at Wardha and devoted most of his time towards reorganisation of Indian villages. 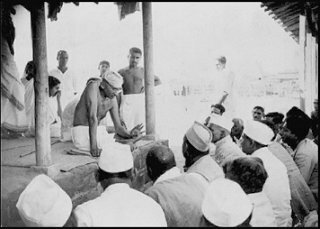 Gandhiji started experiments in rural life-style such as revival of village crafts and agro processing industries, village cleanliness, diet reforms, etc., so that villages could be developed as ideal surroundings to live in. He concentrated on the removal of untouchability also. Before moving to Sevagram village in April 1936, Gandhi had started experiments in various industries at Wardha. He trained many workers in rural reconstruction work such as making Neera from palm trees, jaggery, etc. and in diary, leather work, pottery, oil pressing, bee-keeping etc. He shifted the headquarters of All India Spinners' Association to Sevagram. In Sevagram Ashram Neera was served every morning. Gandhi believed that hand spinning hand weaving i.e. Khadi cloth was the hub around which all the village industries could prosper. With this solar like system, he thought he could rebuild and preserve the Indian village culture. When a nation would become free with its own efforts various experiments would be needed to prepare for the development of the economic conditions of the masses. Gandhiji anticipated this and took steps in that direction. Though Gandhi accepted village life, he could not tolerate ignorance, uncleanliness, laziness jealousy in the villages. Since 1936 till his last, Sevagram Ashram remained his headquarters. Gandhi had organised various constructive work institutions to guide the nation on the road to nonviolent reconstruction of its socio-economic base. The man who fought the mightiest empire in the world, had also simultaneously developed and demonstrated a new way of constructive work for the establishment of a non-exploitative and non-violent social order. This was his ideal in life and a message for the mankind. Gandhi had launched three nationwide movements of Satyagraha. First was the Civil Disobedience in 1921-22. It was suspended later because of breakdown of the moral discipline and eruption of violence against the British. Second was the Salt March in 1930. The third was the Quit India Movement of 1942. India became free in 1947.